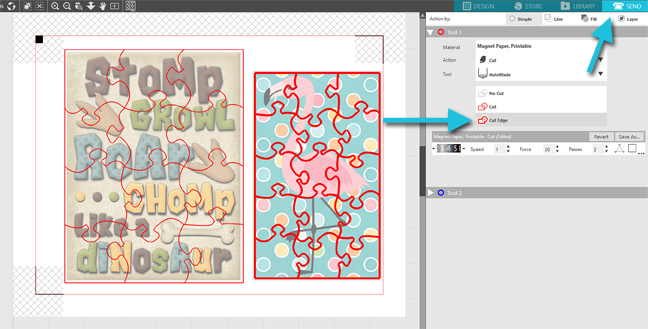 Have you heard about the Puzzle Generator feature in Silhouette Studio® version 4.2? It’s available to those who have upgraded to Designer Edition Plus or higher. This is a fun feature for those with young children, but now that I’ve mostly moved out of the little kids stage, I’ve put together this puzzle kit for my daughters who babysit. Follow along to see how I used the new Puzzle Generator feature to quickly create some colorful magnetic puzzles to carry as a kids’ puzzle kit. 1. 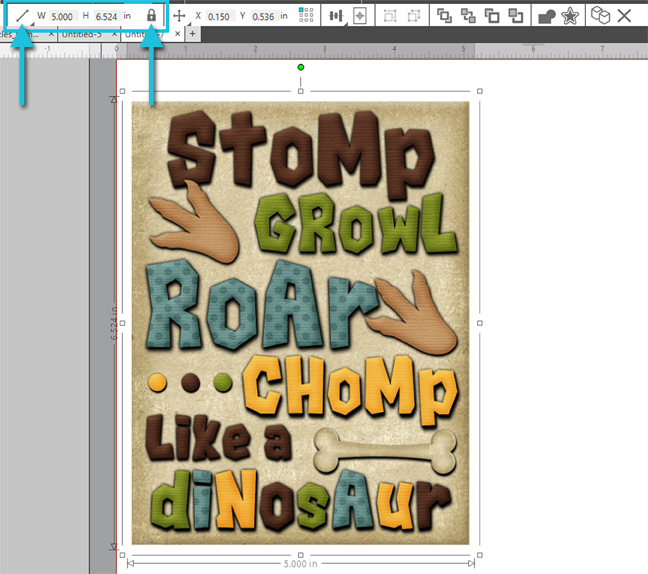 Open “Dinosaur Stomp Growl Roar” (Design ID #122366) in Silhouette Studio® v 4.2. 2. Move the colored image aside and delete the red cut line (ungroup first, if necessary). You won’t need the outer cut edge because the puzzle generator creates its own cut lines. 4. Open the Puzzle panel (requires Designer Edition Plus or higher). 6. It automatically converts that image into puzzled cut lines. 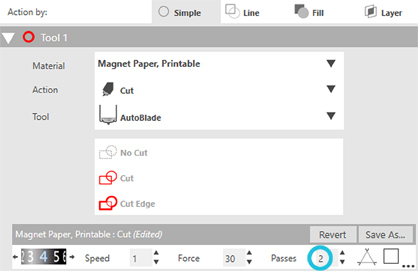 You can customize the rows, columns, and curvature settings. I left mine at the default with 4 rows and 3 columns, so the puzzle pieces are fairly large for little hands. Tip: To learn more about the Puzzle Generator, watch this video. 7. Set your Page Size to “Letter” in your Page Setup panel and turn on the Registration Marks in the third tab of the Page Setup panel. I also set mine to “Landscape” orientation. If this is the only puzzle you want to make, go on to Step Four. I’ve got more room on my page, and it would be nice to have a variety of puzzles in this babysitting kit, so next let’s create a colorful flamingo puzzle. I’m going to use cut files instead of an image, so it’s a little more complex to create than just turning a multicolored image into a puzzle. 1. Open the flamingo (Design ID #62032) and Ungroup it. This one comes uncolored, so we need to convert it to a color-filled design. 2. Open the Fill panel. 3. 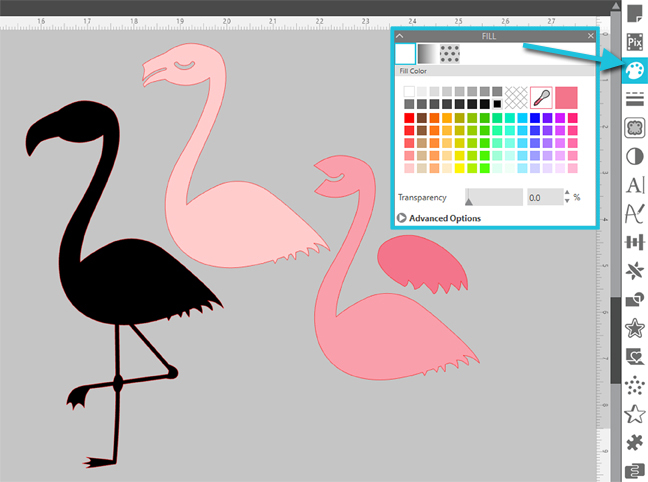 Rotate and recolor the various flamingo parts. I chose black for the piece with legs, light pink for the piece with most of a beak, a darker pink for the smallest body piece, and an even darker pink for the wing. 4. This design is pretty quick to align once the pieces are all oriented upright by selecting all but the wing, then use the Align tools on the Quick Access Toolbar to align all to the top and align all to the right edge. 5. Then drag the wing over to where it looks good. 6. 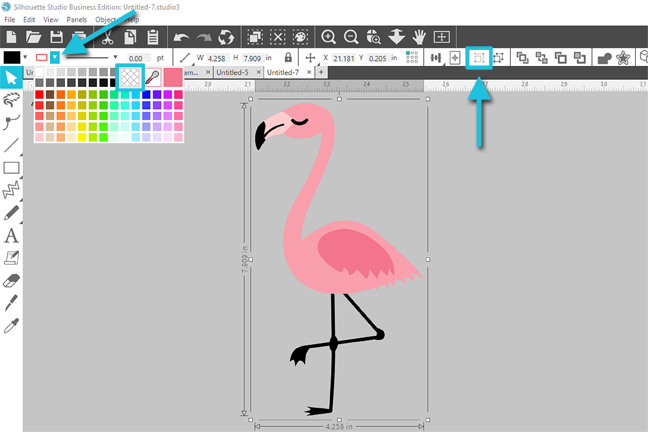 Select all the flamingo pieces, Group, and turn the line color invisible. Note: If you are working with a different design, you may need to use your arrow keys to nudge pieces a little at a time and/or change the layer order of the pieces with your bring forward/backward choices. 7. 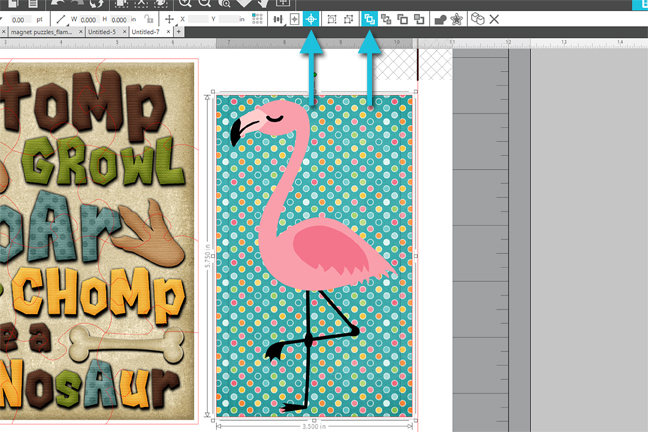 Resize the flamingo to 3 inches wide (remember to lock the aspect ratio first). 9. 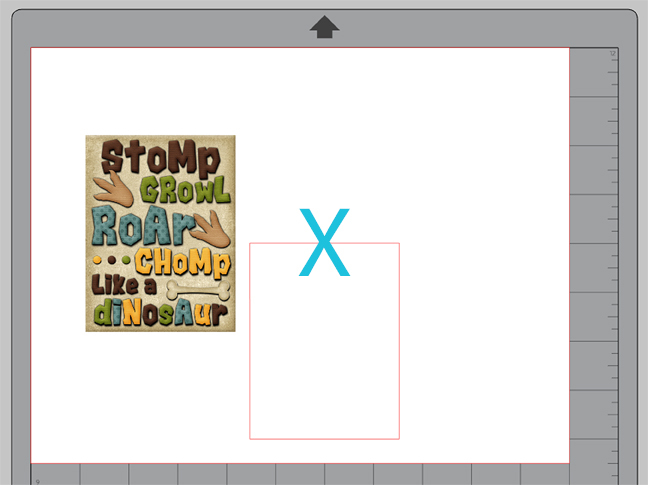 Draw a rectangle and resize it to 3.5 inches wide x 5.75 inches high (unlocked). Keep the rectangle selected. 10. Go to the 3rd tab of the Fill panel to access Fill Patterns and choose one you like. I used Multicolor Circles Paper (Design ID #196336). 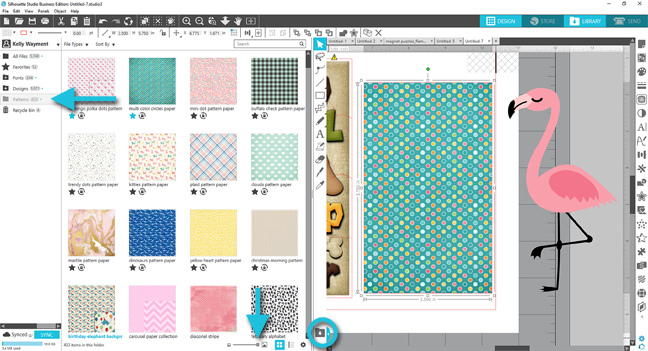 Hint: With the rectangle selected, open the Split Screen Library, open your Patterns folder, and enlarge the thumbnails. 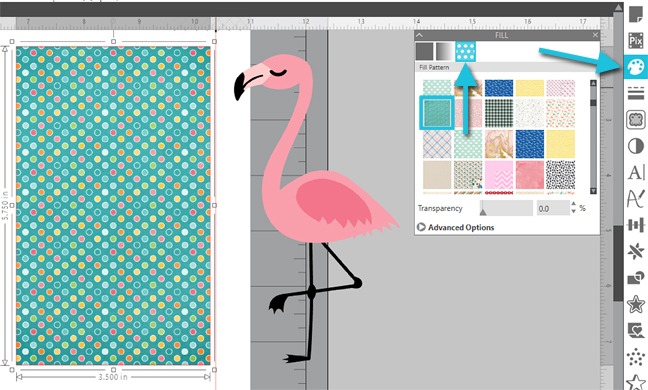 As you click once on a pattern thumbnail, it fills the selected shape with that pattern. 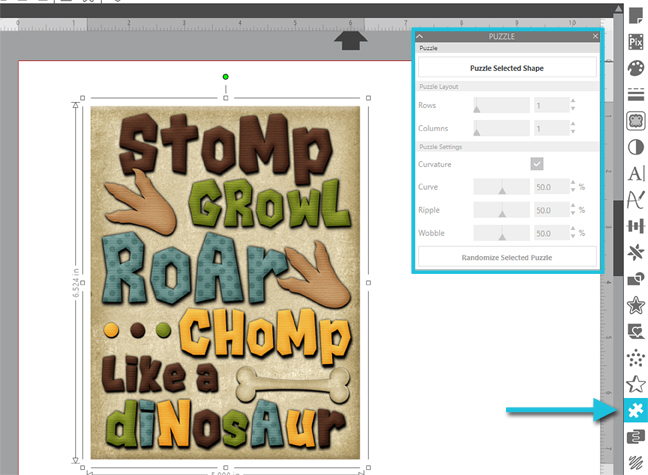 I like this option to see a much larger preview of the patterns than you get in the Fill Panel. Then close the Split Screen Library with the same button. 11. Center the flamingo inside the pattern-filled rectangle. 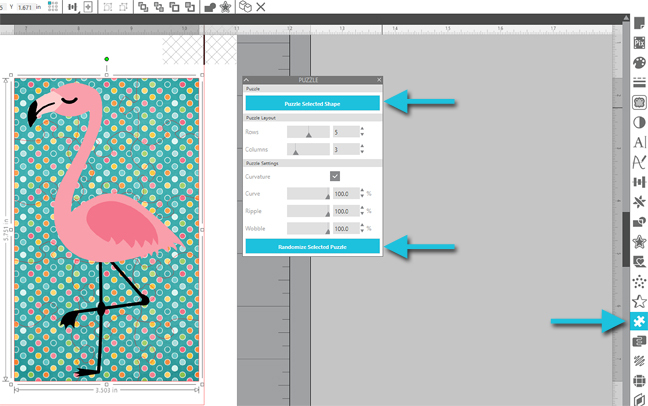 You’ll probably need to select the flamingo and choose Bring to Front in the Quick Access Toolbar. 12. Select just the rectangle, open the Puzzle panel, and choose “Puzzle Selected Shape”. 13. Adjust the layout and image to your liking. I went with 5 rows and 3 columns, and then I chose “Randomize Selected Puzzle” a few times to mix up the connections a little. 14. 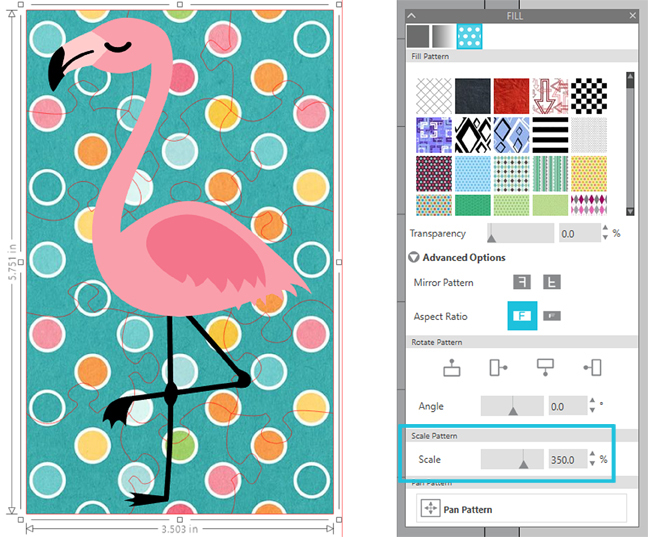 I also enlarged the polka dot pattern by opening the Advanced Options in the Pattern Fill tab of the Fill panel and increasing the Scale to 350%. 15. 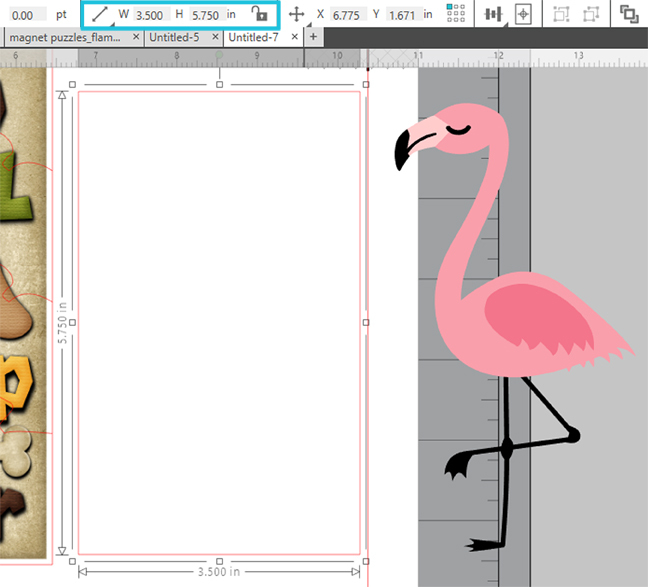 Select the flamingo and its background, and then Group them. Don’t worry that the flamingo doesn’t have the puzzle cut lines overlaid on top. You’ll see that doesn’t matter in the next step. 1. Go to the Send panel and look at the bold preview for cut lines. 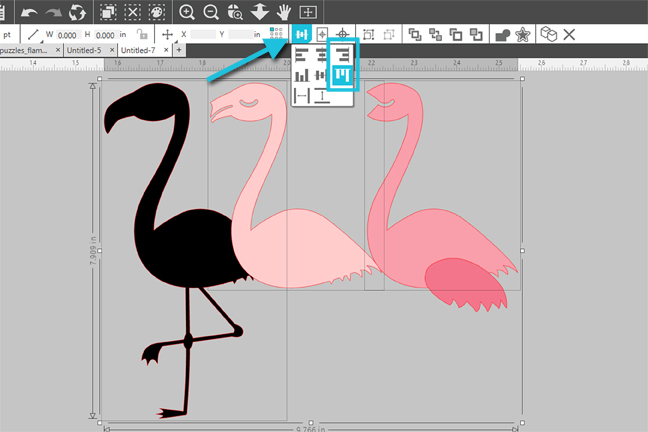 The only thing you want to cut is the puzzle shapes, so any designs you assemble and color from a cut file like the flamingo need to have their cut lines turned off. 2. 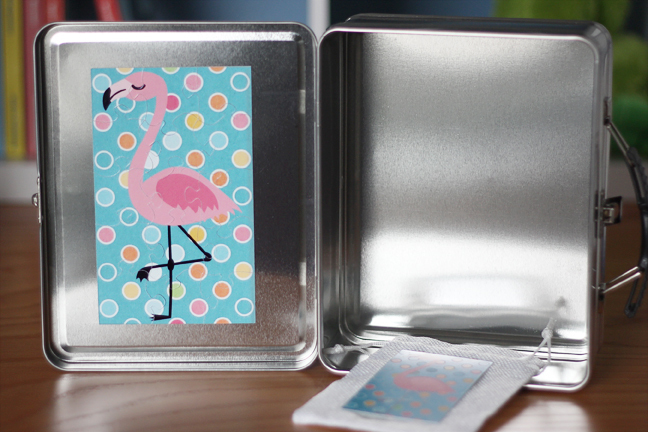 Select the flamingo puzzle and choose Cut Edge. This choice makes the software ignore any inner cut lines, excluding the puzzle lines, in this case. 3. Now the dinosaur puzzle has bold red cut lines and the flamingo puzzle has extra-bold red cut lines, but both will cut where you see those bold cut lines. The visual difference is one is set to Cut and one is set to Cut Edge. 3. 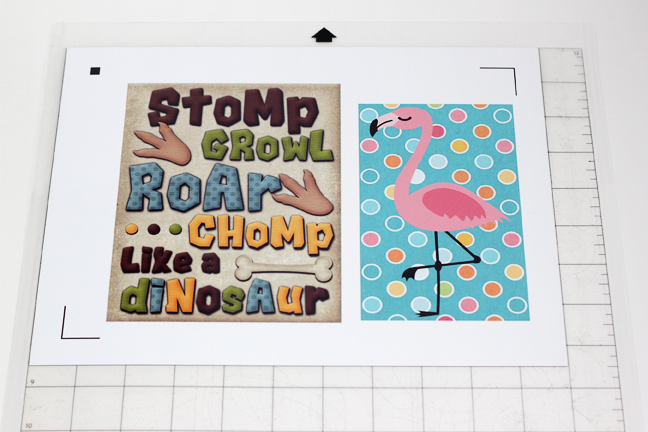 Print your design on printable magnet paper. 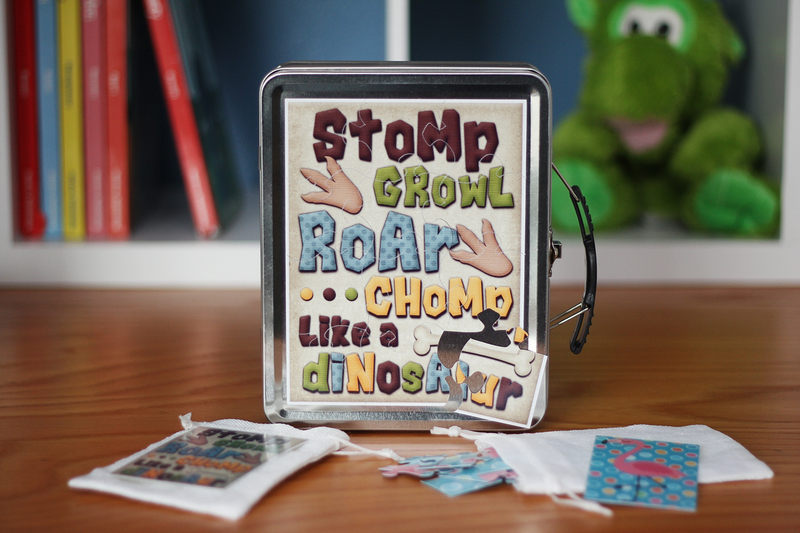 I used the glossy photo settings and high quality for this magnet paper. Make sure you load the magnet paper in your printer so that it prints on the white glossy side. 4. 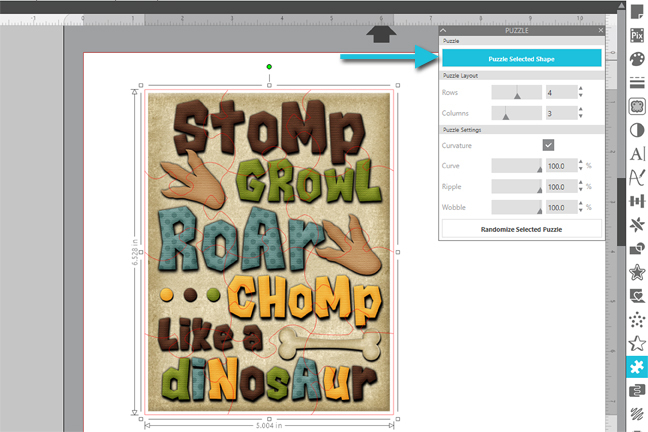 Place the printout on your cutting mat exactly as you see it on screen. I recommend a sticky mat for the magnet paper; it tends to slide on a mat with weak adhesive. Load the cutting mat into your machine. 5. Click Send in Silhouette Studio®. 1. 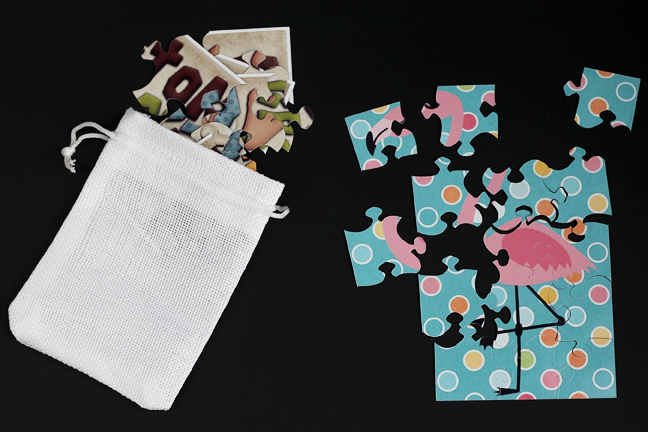 Pull apart the magnets and place the puzzles in individual bags. 2. You may want to print an extra copy of just the design to use as a guide. 3. Carry the metal container with the puzzles inside, and the puzzles will stick directly to the metal container when kids are ready to put them together. I hope you enjoy using the new Puzzle Generator feature, and let me know how it goes!